Throughout the years, OSS Nokalva's customers have had many different requirements for code size, encoding/decoding speed and diagnostic capabilities on various mainstream and embedded platforms. To satisfy our customers' various needs, OSS Nokalva offers our ASN.1 Tools for C++ runtime libraries in three flavors. You can change from using one flavor of the ASN.1/C++ runtime to using another with no impact to your application code. See the ASN.1/C++ Runtime API Overview for instructions on how to switch between the various runtime flavors. For details about each of the ASN.1/C++ runtimes, please consult the ASN.1/C++ Runtime API Overview. Which ASN.1/C++ Runtime is Right for Me? 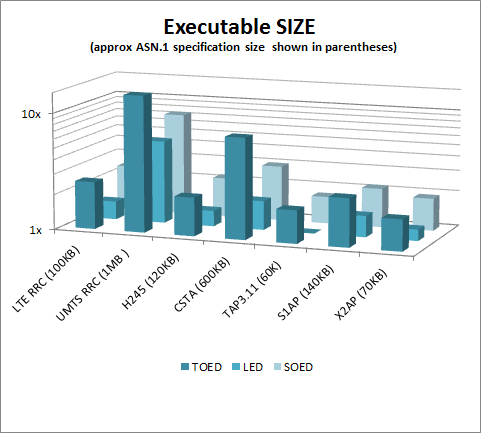 Use the table below to choose the ASN.1/C++ runtime that best suits your needs, based on its performance (expressed as both code size and the speed of encoding) and diagnostic capabilities. The following charts depict runtime performance results based on several standard ASN.1 specifications to help you get a feel for the comparative performance (code size and time spent during encoding/decoding) of each of the ASN.1/C++ runtime flavors. 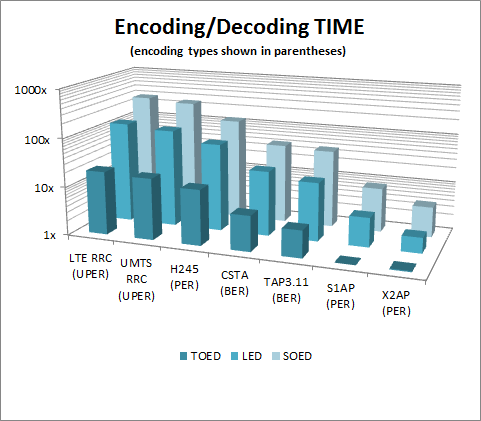 The same generic encoding/decoding application was used for all measurements. The size of the application object code was compared, which was obtained from C++-compiling and linking the sources and the control table (if applicable) generated by the ASN.1 compiler, as well as the application code and the corresponding runtime libraries.